When the new Carnival Horizon debuts in Europe in April 2018, the atrium sculpture will feature artwork created by St. Jude Children’s Research Hospital patients. The massive LED “Dreamscape” atrium sculpture will offer 33 different artistic creations from St. Jude patients, one of Carnival’s largest charitable partners. “As the hospital’s Official Celebration Partner, we couldn’t be happier to showcase these amazing creations designed by the talented St. Jude patients on our newest ship,” Christine Duffy, president of Carnival Cruise Line, said in a news release. 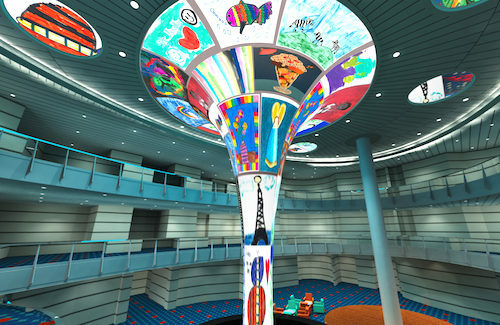 The eye-catching, three-deck high centerpiece in the Horizon’s atrium is a 24-foot funnel-shaped centerpiece. Designed by Techno Media, Dreamscape debuted on Carnival Vista and is comprised of more than 2,000 flexible LED tiles that have been customized for the shipboard environment. Each day, technicians on board program the rotating artwork based on the time of day, port or occasion. “Featuring the inspirational artwork of St. Jude patients in the Carnival Horizon atrium is an extraordinary example of how Carnival Cruise Line continues to find creative ways to raise awareness of our mission to find cures and save the lives of children,” said Richard Shadyac Jr., President and CEO of ALSAC, the fundraising and awareness organization for St. Jude Children’s Research Hospital.